To do this, I use the node package called"node-qunit-phantomjs". and I just run it using node which then runs the Qunit Tests using PhantomJS in a "headless" mode and then reports in the terminal if my tests pass or fail. Now the issue comes when I use Teamcity to run my node QUnit script, as Teamcity cannot read the terminal output put out by "node-qunit-phantomjs" it does not show a Build Step Fail (if there are any QUnit Test Fails), it just runs the node script and if that runs without any node runtime issues it notifies us of a Build Step Pass always. 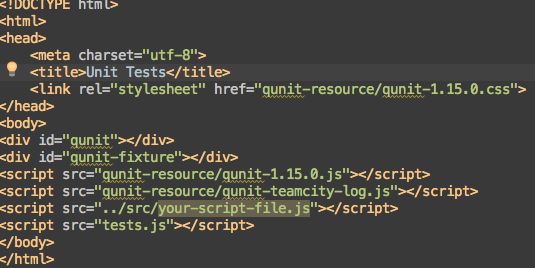 To get Teamcity to work with QUnit we need to write a basic "hook" to work with QUnit test callbacks and write some console.log() comments that Teamcity can "understand".